Knowing when to irrigate is important in a Burdekin sugarcane cropping system - irrigating too early can lead to significant water and fertiliser losses! Additionally, irrigating too early or too late can lead stress the sugarcane out, causing yield losses. 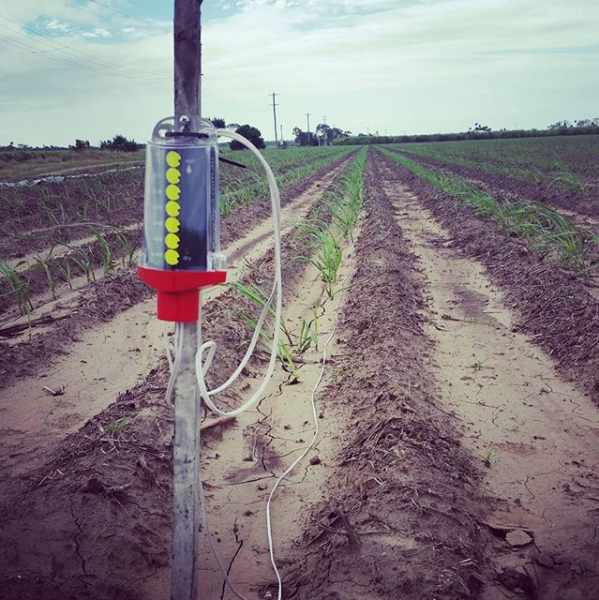 To help growers with know when to irrigate according to crop requirement and soil types on their farm, Farmacist is providing growers with a free GDot (pictured). One of our extension officers will calibrate the GDot to your cane growth by measuring the cane daily for two irrigation cycles. You'll also recieve heaps of data for the soils on your farm and One-on-One support to help you understand and use the GDot! For this project, Farmacist is collaborating with Laurence Pavone of Sugarfix Consulting, to build a base station network around the Burdekin. This network will be free for growers to use! We will also be developing some end of row sensors that can be placed at the bottom of an irrigation set. When the water has reach the bottom of the paddock and gets the sensor wet, the sensor will send a message to the nearest base station, which will then send a message to the growers phone, telling him the irrigation set is finished. The grower can then either turn the pump off or change sets! Growers involved in this project will recieve a free end of row sensor to trial on their farm. For more information about the sensors, Click Here. There is still space avaliable in both projects! If you'd like to be involved in either project, please call the Burdekin office (07 4782 2300) or one of our agronomists.